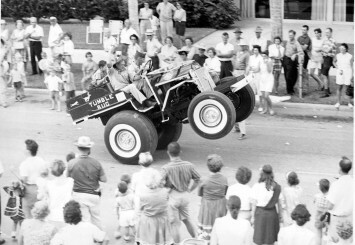 Local historians credit a Naples resident, Ed Frank, as the “father” and inventor of the first swamp buggy. He developed his original skeeter between 1918 and 1920 for hunting in Southwest Florida’s boggy forests and prairies, using parts from junked Model T Ford and an orange crate for a seat. As time went on, Frank perfected his design and added an extra transmission, tire chains, and upside down axles to give more clearance for driving over tree stumps.